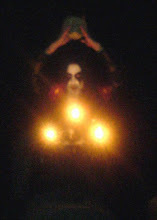 Devoted to Satan was released in January 1994 by one of the lesser-known bands of the French Black Legions, Torgeist. Many are only familiar with them through their split album with Vlad Tepes and, though that material is superior to this, their first demo may be worth checking out for those into the LLN. The production is rough, as one would expect. However, it is not necessarily in a good way. The guitar sound is thin and has a decent amount of fuzz, but it still lacks any real edge. The drumming is pretty bad, possessing a hollow sound that is actually kind of distracting and gives the whole recording a rather childish sound. Instead of sounding raw and necro, this just sounds bad. Thankfully, by the time they recorded Time of Sabbath, they corrected some of these problems. The songwriting is rather primitive but, again, not really in a positive sense. In this case, the material is simplistic and not terribly engaging. It fails to really create any sort of dark atmosphere, mostly just plodding along and going through the motions, without doing anything worth noting. 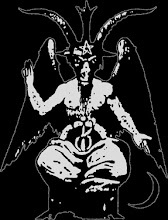 The harsh vocals are there, as well as the lo-fi production and Satanic lyrics and imagery. And yet... nothing. This is so far below their second demo that it almost seems like a completely different band. Devoted to Satan is not the best musical tribute ever dedicated to the lord of Hell. In fact, this is so boring and lackluster, one might imagine that Christians were behind this as a means to secretly defile and insult the Black Metal cult. There is absolutely no feeling behind any of the music on this tape. It is very uninspired and hardly worth the time to bother with, unless you are just really curious. Click image to visit official site. 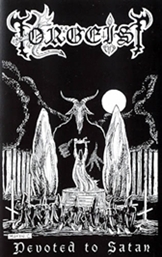 The Rites of the Black Moon Webzine was created by Noctir during the frozen nights of January 2008. All written content is the property of Noctir, unless otherwise stated. Do not reproduce anything without permission. Cover art and lyrical excerpts are property of their respective artists / label. Send questions, comments or criticism to noctir@hotmail.com.